Ironically, the P&WV was a relative latecomer to the industry; much of its network was not constructed until after 1900 and the road only truly came of age during the 1930s. The Pittsburgh and West Virginia Railway was another western Pennsylvania/northern Ohio system serving Pittsburgh's once prolific steel industry. As a result it moved considerable coal, coke, and iron ore. However, the railroad is perhaps best remembered for its status as a bridge line and member of the famous "Alphabet Route." This marketing endeavor was a chain of smaller railroads, which competed with large eastern trunk lines (Pennsylvania, New York Central, and Baltimore & Ohio) in lucrative merchandise freight between the hotly contested New York -Chicago corridor. The concept was actually quite successful for many years. Today, virtually the entire P&WV main line from Connellsville to Pittsburgh Junction survives as a key route for the reborn Wheeling & Lake Erie Railway, a profitable Class II startup of the early 1990s. The Pittsburgh and West Virginia Railway began as a dream of the Gould interests, launched by father Jay and carried on through son George, to complete the holy grail of railroading, a true coast-to-coast transcontinental system. They nearly accomplished the feat except for a small unfinished section between Pittsburgh and Connellsville, Pennsylvania. From west to east their portfolio included the Western Pacific, Rio Grande Western/Denver & Rio Grande, Missouri Pacific, Wabash Railroad, Wheeling & Lake Erie, Wabash-Pittsburgh Terminal Railway, and the Western Maryland. The immediate history of the P&WV begins with the Wabash-Pittsburgh Terminal (W-PT), formed on May 9, 1904 as a consolidation of several smaller systems Gould had launched to build across Pennsylvania, pass through the Northern Panhandle of West Virginia, and link up with the Wheeling & Lake Erie at Pittsburgh Junction, Ohio. These small roads included the Cross Creek Railroad (chartered in Ohio on April 23, 1900); Pittsburgh, Toledo & Western (formed on April 3, 1901 in West Virginia), and the Pittsburgh, Carnegie & Western (created on July 17, 1901 in Pennsylvania). The P&WV And The "Alphabet Route"
All three projects began construction almost simultaneously and within a few years were ready for service from Pittsburgh to Pittsburgh Junction, Ohio (63.31 miles). According to the article, "Middleman Of The Alphabet Route," by Gus Welty from the November, 1956 issue of Trains Magazine, the W-PT operated its first train on June 1, 1904. It also constructed an elaborate passenger terminal in downtown Pittsburgh which opened on April 13, 1904. Known as the Wabash Pittsburgh Terminal it was designed in the Beaux-Arts style by architect Theodore Carl Link featuring eleven stories and a beautiful dome set upon the roof. It was constructed at a cost of $800,000 and served in its original capacity until 1931 and later razed in 1953-1954. Aside from his long range plans, Gould's WP-T moved substantial freight related to the steel industry through his partnership with Andrew Carnegie. 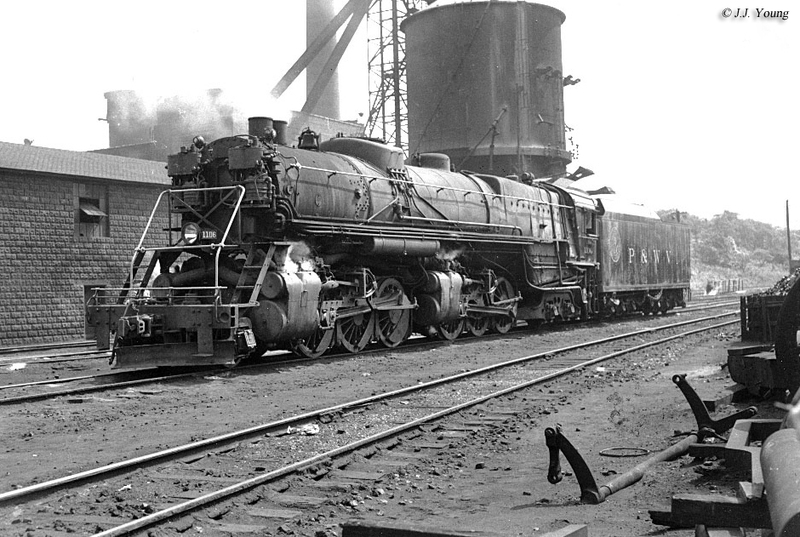 The steel tycoon had been involved in a longstanding battle with the Pennsylvania Railroad regarding freight rates. As a result, he worked with Gould's railroad, as well as his own Union Railroad, to move raw materials and finished products. Carnegie also had an interest in the Pittsburgh & Lake Erie, which acted in a similar fashion to the WP-T by handling heavy steel-related tonnage from Pittsburgh to northeastern Ohio. The P&LE eventually became a profitable arm of the New York Central. Over time the PRR and Carnegie worked out their differences. Unfortunately the financial Panic of 1907 ended Gould's transcontinental dreams as bankruptcy caused him to lose the properties under his control. This included the Wabash-Pittsburgh Terminal, which entered receivership on May 29, 1908. As Mr. Welty points out the railroad emerged on January 29, 1917 as the Pittsburgh & West Virginia Railway, an independent company which would remain so for another 47 years. For nearly two decades it remained relatively profitable but had little success in accomplishing its goal of opening an eastern outlet. Finally, under a project started by Frank Taplin in the 1920s this initiative was achieved. 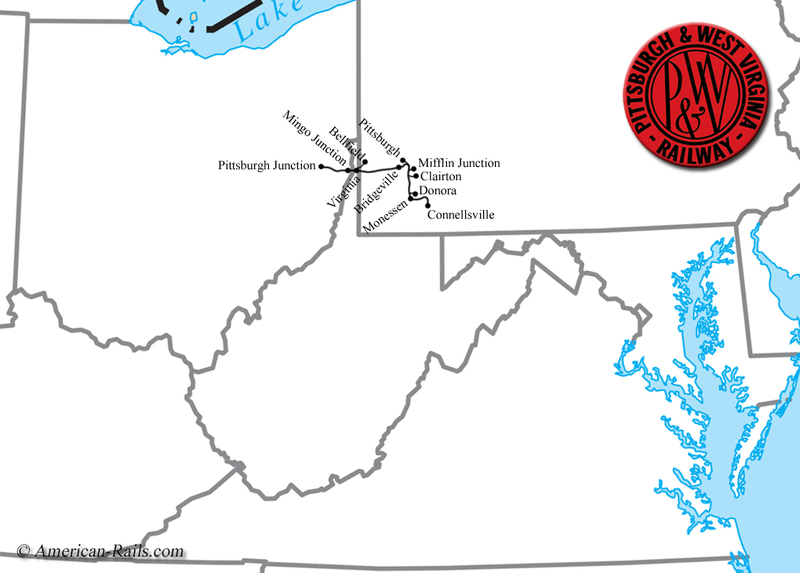 Interestingly, Taplin's lofty vision was to see the P&WV merge with the Wheeling & Lake Erie, Western Maryland, Wabash, and Lehigh Valley to produce an eastern trunk line rivaling the Baltimore & Ohio, Erie, PRR, and New York Central. Unfortunately, his dream was shot down by the Interstate Commerce Commission although one component of the idea was completed, an extension from Pierce, Pennsylvania to Connellsville opening in the spring of 1931 (in 1928 it also gained control of the small West Side Belt Railroad, connecting Pittsburgh with Clairton). This provided it a connection with the WM and the two went on to form part of the "Alphabet Route," a group of eight railroads offering high-speed freight service from Chicago to New England. The others comprising the group included Lehigh & Hudson River﻿, New Haven, Nickel Plate, W&LE, Reading, and Central Railroad of New Jersey. 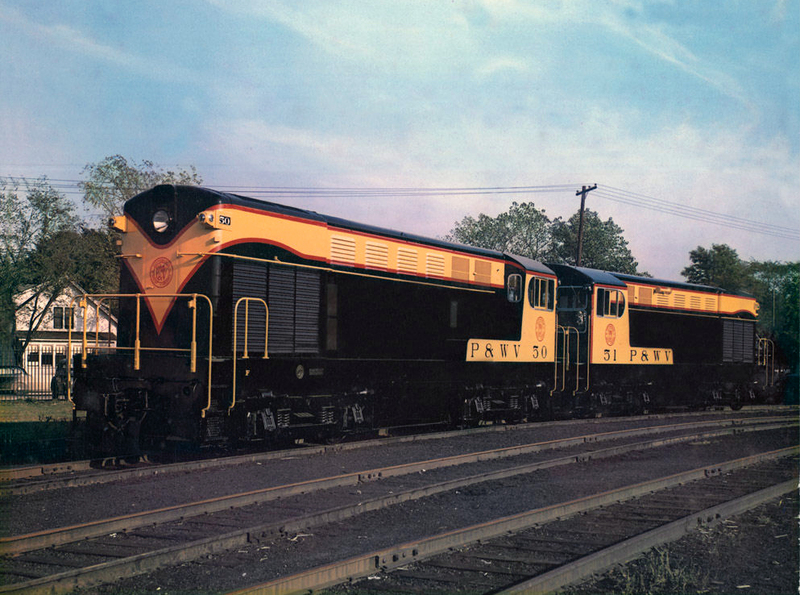 By the 1930s the P&WV handled a variety of freight from hotshot merchandise trains (the "Alpha Jet" symbol trains included MS-1 [the Michigan Steeler] with eastbound runs AJ-4, AJ-12, AJ-2, and westbound consists including AJ-1, AJ-3, and BT-1) to coal, coke, and iron. That decade also witnessed the railroad upgraded with centralized traffic control (CTC) for more efficient and safe operations. It contained a total 131.59 route miles of which 111.2 were main line miles. In 1955 it carried an operating revenue of $8.6 million of which $873,970 was net income. The decade also witnessed the road's transition to diesels, completed in 1953. Its motive power was unique for a Class I of that time, relying almost exclusively on the opposed-piston designs of Fairbanks-Morse. FM was a relative newcomer to the railroad market although it had built marine engines, quite successfully, for many years. The diesels, though, were never as impressive as the road's steam fleet which consisted of some very large arrangements given the road's small size. There were handy 2-8-0's, 4-6-2's, and 2-8-2's as well as the P&WV's biggest power, mammoth 2-6-6-4's. The latter were a small fleet of seven built by the Baldwin Locomotive Works between 1934 and 1937 offering an impressive 97,500 pounds of tractive effort. The articulateds were normally used between South Pittsburgh's Rook Yard and Connellsville where the worst grades were located. In 1964 the Pittsburgh & West Virginia lost its independence when it was leased by the Norfolk & Western on October 16th that year. The N&W spent much of that decade gobbling up other systems. 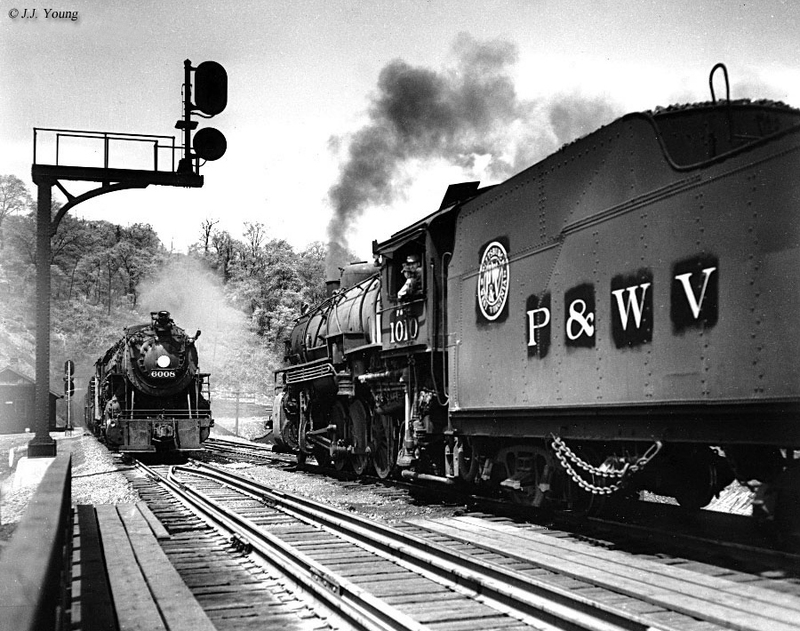 Three years later the Pittsburgh and West Virginia Railroad was set up by the N&W as a real estate trust to acquire ownership of the P&WV property, effectively relegating it to the history books. All of the above information concerning the P&WV's steam locomotive roster is courtesy of Gus Welty's, "Middleman Of The Alphabet Route," from the November, 1956 issue of Trains. The road's two Pacifics had been assigned to freight service after the P&WV discontinued passenger trains in 1931. In an interesting twist the P&WV still lives on today. The N&W retained virtually all of the railroad’s routes upon purchase and when the N&W’s successor, Norfolk Southern, spun-off the P&WV’s lines in 1990 to the new Wheeling & Lake Erie Railway they have become a very important corridor under the W&LE. Today the Wheeling and Lake Erie Railway is going as strong as ever with a traffic base in coal, iron ore, steel, aggregates, plastics, chemicals, forest products, and grain! The Conrail breakup has also allowed it to dabble into the profitable intermodal business. Because of this, coupled with a strong management team extremely dedicated to not only the railroad’s success but also its future growth, things are looking as bright as ever on the W&LE. If you are interested in visiting the Wheeling and Lake Erie Railway its east-west main line runs between Bellevue, Ohio and Pittsburgh. However, the "hub" of the railroad’s operations continues to remain in Brewster, as it has when since the railroad began in 1871.